A very early Lionel No. 8 “PAY AS YOU ENTER” standard gauge Trolley, circa 1908. Few known to exist. Click here to view. 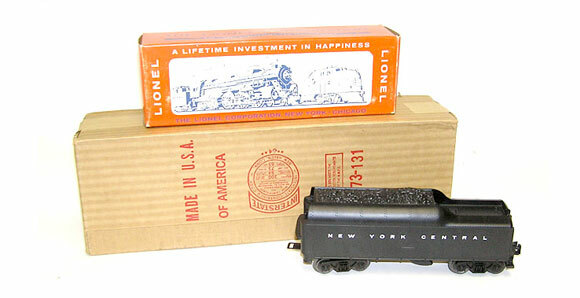 The ultimate Lionel Standard Gauge Train – the rare “Blue Comet” Set 396E from 1930. Featuring the 390E cream striped Steam Locomotive. Click here to view. In my opinion, here is the ultimate Lionel prewar “O” gauge Steam Engine. The 1937 version of the Lionel No. 700E Locomotive with its 700W Tender Click here to view. 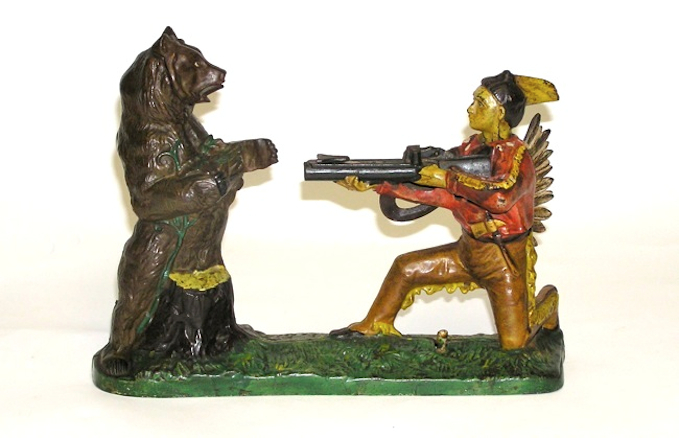 Here is an extremely nice bank – the Indian Shooting Bear cast iron mechanical bank, manufactured by J & E Stevens, circa 1883. Click here to view. 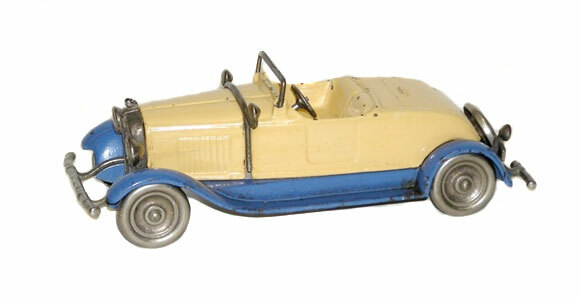 Here is a scarce toy – the Pratt & Letchworth 4-Seat Brake. Circa. 1890. 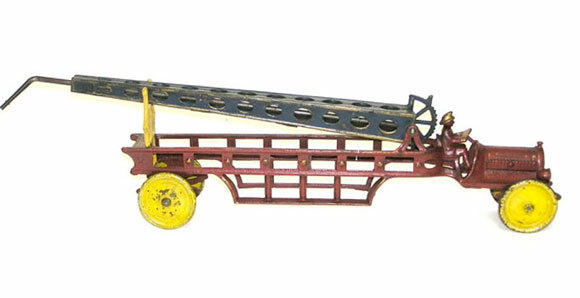 A wonderful looking toy measuring a large 27″ long. 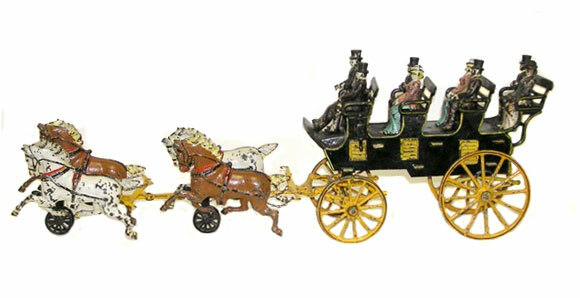 All original cast iron figures on top of the carriage. Click here to view. Here is an extremely nice Kilgore Stutz Cast iron Roadster with nickel wheels, bumpers, headlights and spare. This large car measures 10-1/2″ long, Rarely seen in this kind of condition. Great original paint. No breaks or cracks. Would be an upgrade to most collections. Click here to view. 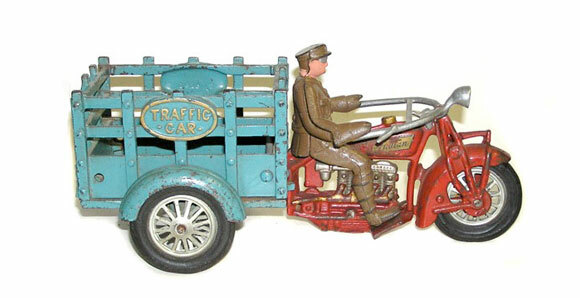 Here is a wonderful Arcade cast iron Model A Car Carrier from 1928. Includes (4) Arcade Model A Fords, each 5″ long. Total length of this large toy is 24-1/2″ long. All the wheels on both the car carrier and cars are original white rubber tires. This is one of the few examples of this toy that exist. CLICK HERE to see more. Here is a wonderful looking toy – and very hard to find. This is the largest sized Hubley “Indian” Traffic Car. Measures 11-1/2″ long. Embossed “Traffic Car” on the back cart. Original rear gate. CLICK HERE to see more. 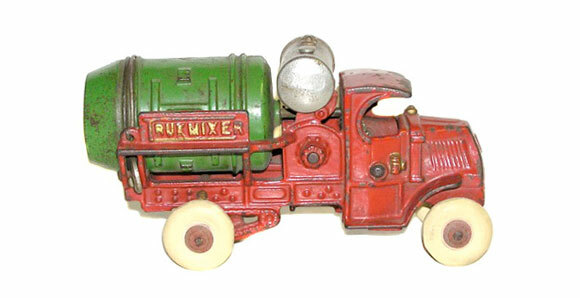 A rarely seen cast iron toy from Hubley of Lancaster, PA. This is called their Trux-Mixer. Measures 7-1/2″ long. Only a few of these are known to exist in this kind of condition. CLICK HERE to see more. 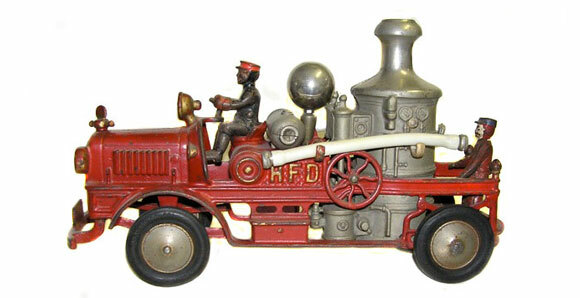 This is called the Hubley HFD Fire Engine. Measures a large 14-1/2″ long. This has the integrated bumper, original driver and man in the rear. A rare and beautiful piece. CLICK HERE to see more. 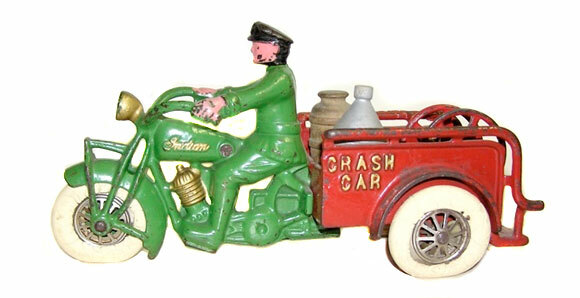 Here is a very rare Hubley Indian “Crash Car” Motorcycle. Difficult to find in this 9″ size. In wonderful condition with its original hose reel in the back. Original red and green paint and white rubber tires. Truly a scarce item for your collection. CLICK HERE to see more. 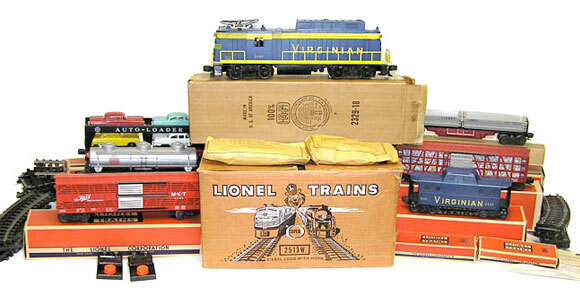 Here is probably one of Lionel’s top five most desirable sets to own. Set No. 13068 – The “Goliath” freight set from 1962. This is an unrun, mint example. CLICK HERE to see more. 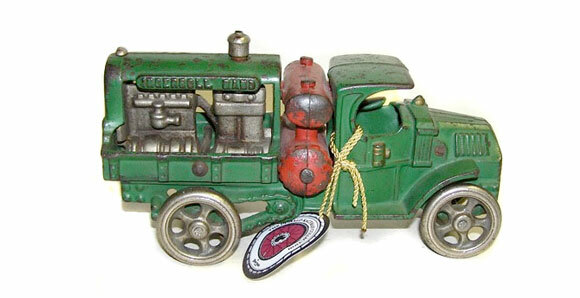 Here is one of Hubley’s top cast iron toy trucks. Called the Ingersoll Rand Compressor Truck. Nickel plated cast iron wheels. Circa. 1933. Only a few known to exist in this condition. CLICK HERE to find out more. Here is a scarce Kenton Water Tower Fire Truck. Only a few examples known. It measures a large 24″ to the end of the water tower. CLICK HERE to find out more. 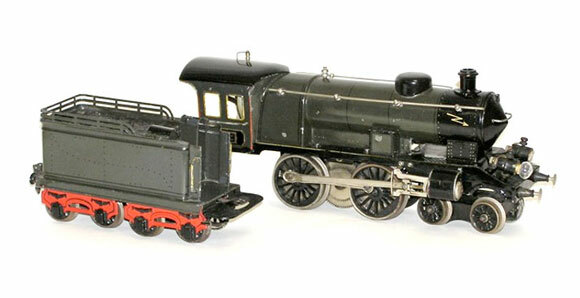 Here is a beautiful Marklin Gauge I Steam Engine and Tender. 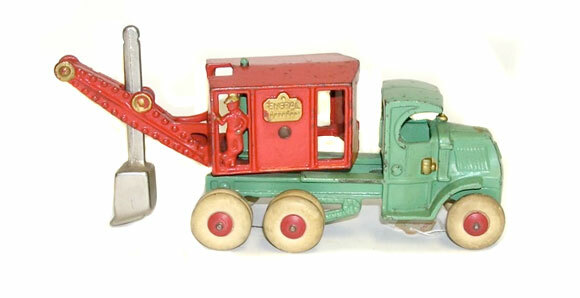 Made in the 1920s, this hand painted tin electric engine is in beautiful condition. CLICK HERE to find out more. Here is a train you won’t see very often. A factory SEALED Lionel Postwar “O” Gauge No. 773 Hudson Steam Locomotive – with its matching NYC No. 773W whistle tender. This is a 1964 version of this train. Unrun. CLICK HERE TO FIND OUT MORE. 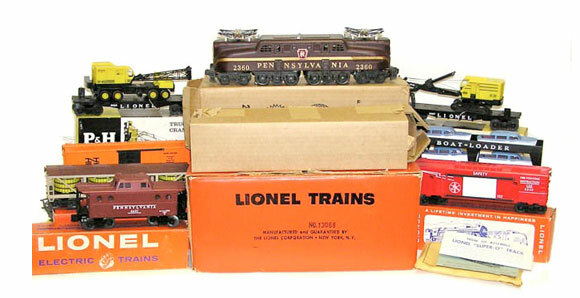 Here an extremely desirable set of Lionel “Super O” gauge trains from 1957. CLICK HERE to see more. Here is a sampling of some outstanding examples of toys, trains, banks, figural, and other antique collectibles from some of the best collections in the world. Provide us your e-mail address and we will alert you when new items are listed in your field of interest. What is on your Watch List?